which enables the acquisition of basic science, international and industrial perspectives, and the fostering of human resources capable of being leaders in any area of industry, government, and academia. As competition in the global market has intensified, the automotive and electrical appliance industries that once supported Japan’s growth are facing severe difficulties. Even in the fields of electronic devices and material technologies, which have always been particularly strong elements of the Japanese industrial world, there is now a tremendous pressure from nearby Asian countries. Looking towards forthcoming economic recovery, there is a need for science technology to be a new core to support future industry. The area of research focusing on materials with molecular functions is expected to make good use of diverse molecular structures so that a wide range of scientific fields, including green science and life science, could be established and expanded vividly. In order to build a new “smart society”, there must be an advanced functional expression of molecular materials and a systemization of individual functions greatly exceeding the existing concepts. 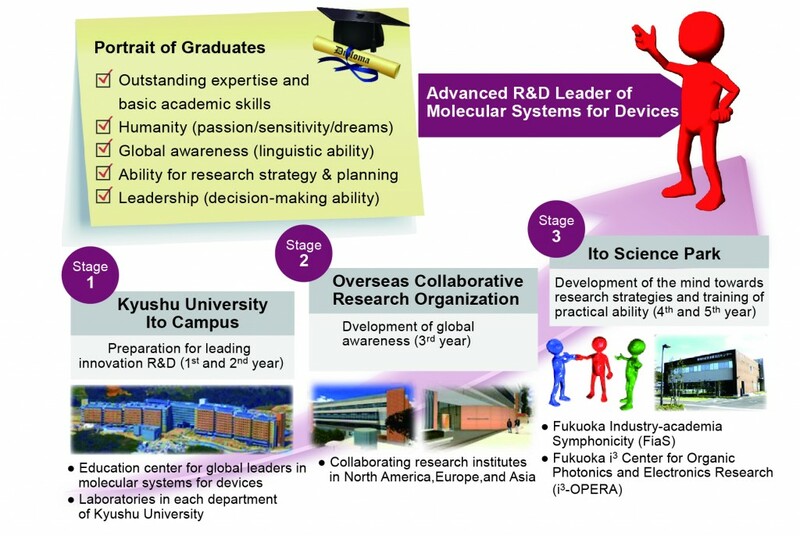 In this education program, the new area of “molecular system devices” promoting next-generation industry will be built based on Kyushu University’s research results in the scientific fields of molecular accumulation, molecular information and molecular systems. “Electronic devices” and “material technology” are presently the strong areas of Japanese inductry, but the electronics field is facing a state of crisis due to the strong pressure from nearby Asian countries. For that reason, practical application of materials with molecular functionalities, such as organic electronics, is anticipated to become a major economic success as a new field of industry. 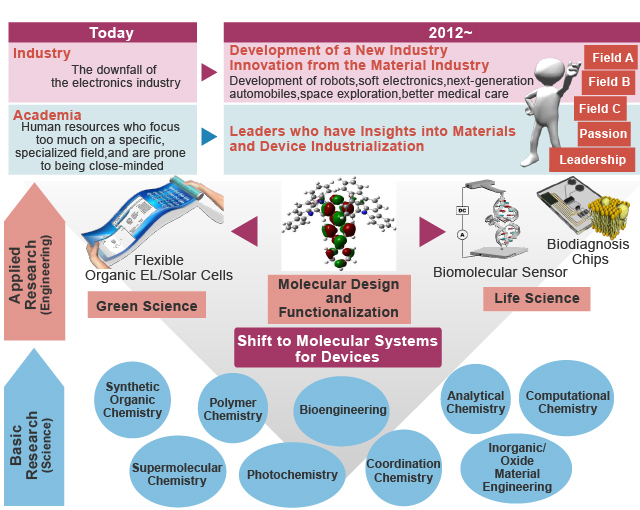 These science technologies are believed to grow into a major trend of new science-based industry as “molecular system devices”. Great leaders being active internationally in industry, academia, and government will be fostered from this program. They will be equipped with advanced expertise, enriched creativity, strong abilities to view issues in a broad context, to think conceptually and to take actions, effective communication skills, and sensitive global mindset. 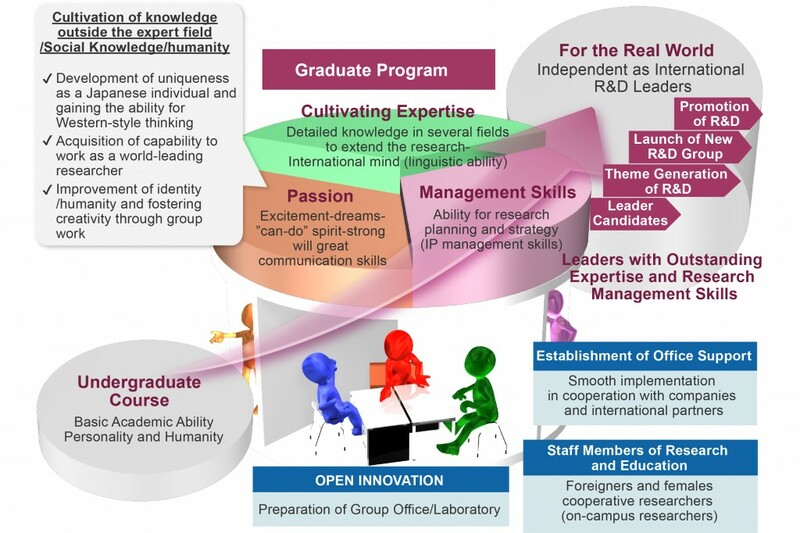 Opportunities will be created to motivate the graduate students to become R&D leaders of advanced molecular systems for devices, and startup positions for their growth will be provided. The logo was based on the image of molecular systems for devices, and the English course name is a combination of the first letters M, S, and D from “Molecular Systems for Devices” and the L from the word leading in the “Program for Leading Graduate Schools.” The large and small colorful dots that connect and spread outward incorporate the hope that this course will foster globally competent human resources from highly individual students who mutually leverage their talents in groups and cooperate to produce a friendly rivalry.